The demand for hotel services has steadily increased these past few years, tilting the negotiating leverage in favor of preferred properties rather than the event planning clients. It has put extra pressure on event planners to find ways to negotiate with hotel sales to lower some of those expenses. Depending on an event planner's circumstances, these tips will help achieve some measure of savings with guest rooms, meeting services, and catering. Leverage Multiple Meetings at the Same Location: One of the more effective strategies for saving money is to hold the bulk of your events throughout the year at the same property. Hotel sales managers are looking to achieve certain revenue numbers that they are likely to show more flexibility to a client who they know will return throughout the year vs. a one-time client. 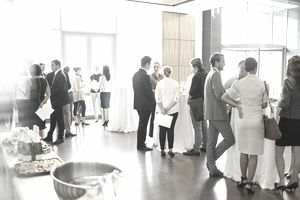 Leverage the Total Number of Guest Rooms for the Event: Hotel sales managers will show flexibility in meeting room space costs and even catering expenses if they know that an event will incorporate a block of rooms. Guest rooms offer a greater profit margin than any other event service. Leverage Additional Discounts on Guest Rooms: Sales managers will also discount guest rooms or provide their clients with the lowest rate at that time. Event planners should compare the prices that sales managers provide against any corporate contract already established with that hotel -- especially if it's a chain -- to secure the best price. Negotiate Food and Beverage Requirements: Many planners will cut costs by adjusting this category, and hotel managers are happy to assist. The menus are designed to be adjusted to meet anyone's budget. However, in my experience, it's better to identify your preferred food and beverage needs, and request discounts as the prices exceed the budget. Hotel managers understand: event planners are in the business of keeping their guests happy, and so is the hotel. Negotiate the Audio/Visual Expense: A/V is an area where hidden expenses can quickly add up, and sometimes can be negotiated, but not always. Renting LCD projectors varies from venue to venue, and can be priced quite outrageously. As long as your venue doesn't demand unionized labor, be bold and suggest discounting here, even quoting your own preferred fee. And ask for some expense items to be waived, if possible. Hourly rates on labor are non-negotiable. Venues are aware of client frustrations with A/V fees and are outsourcing operations to third-party companies instead; eliminating any negotiating responsibility. Leverage Total Event Spent at the Hotel: Sales will provide an event planner with costs for each expense item and/or service separately. This "line item" approach favors the hotel or venue and not the client. As this occurs, an event planner should compile the total investment in their program at a property, and discuss reductions based on the total amount of money being spent on all services. At the end of the day, the hotel sales manager knows how much money they would like to receive in exchange for their services. For those who tally their costs and address the bottom line, more savings will follow. Be Extremely Flexible on Time, Space, and Dates: Hold a program during non-peak dates and watch how flexible the hotel sales manager will become. Also, if a planner is flexible on their space requirements, hotel sales are likely to find them a spot and an optimal price. While an event planner is searching for that one space during a small window of time when the hotel has everything else otherwise booked and doesn't anticipate selling that space, this creates an opportunity for both parties. Compare quoted hotel guestroom discounts to online consumer travel search engines. It's amazing how often you may notice that that search engines such as Expedia or Travelocity, and other sites that may offer more cost-effective than those offered by a hotel sales manager to a corporate or organizational client.